As we saw in part one, there are multiple issues that can impact negatively on your swimming experience; from green algae growing on the walls of the pool to fading paint and broken lights. However, when there are problems with the pool’s plant room equipment, this can represent a hazard to swimmers and could even result in an accident. For this reason, it is important to be able to recognise when your plant room equipment may not be operating correctly so that you can call in the professionals to inspect the equipment and get it fixed. Pool water not heating up to its normal comfortable temperature? This could be due to a number of reasons, for example a blocked heat exchanger, broken thermostat or faulty pressure switches. A malfunctioning pool heater can make it impossible (or at least highly unpleasant) to take a swim, but it can also present a risk so this is not DIY job! It is vital that your gas swimming pool boiler is serviced by a Gas Safe registered engineer on an annual basis to ensure that it is not only working correctly, but also that it is safe and not emitting any harmful gasses. Pumps make a low level noise, so any unusual sounds should be taken as warning that something is wrong. Likewise, if you spot a leak from a joint, a puddle underneath the pump or calcium deposits around the pump, there is a problem. You can try to diagnose the problem yourself, but most likely a pool engineer will need to examine the pump. If you do decide to investigate yourself, turn off the pump and then examine the impeller to see if it is clogged up with dirt. If so, remember to protect yourself with gloves when giving it a thorough clean. If your pump is powered using long extension cords, this may be impacting the pump’s functionality, so it might be best to call in an electrician if you cannot provide a power source closer to the pump. Also, a worn out pump motor may cause a problem, as these tend to become less effective with frequent use over the long term. Ensure that the pump is running at the correct voltage – most pool pumps require no greater than a 20-amp circuit to power them. Running the pump at an incorrect voltage can result in many hazards including fire and electrocution, so be extremely careful in adhering to the electrical guidelines of your equipment. In case of an accident, there must always be an electrical disconnect switch within the immediate proximity of the swimming pool. However, the switch should be far enough away from the pool that it is impossible to reach from within the pool itself, eliminating the hazard. If you have a problem with your plant room electrics or are looking to make an alteration, this must be performed by a qualified electrician. The presence of sand in the swimming pool is a sure sign that there is a problem with the pool filter – this could mean that the internal laterals of the filter are damaged and need replacing. The most common type of filter used to keep the water clean is the pressure sand filter. The process involves pumping water into a cylindrical chamber containing sand media which helps to capture the dirt and debris, stopping impurities from being pumped back into the pool. A good sand filter can last for more than a decade without needing a change of sand, but for optimal results, a sand change is recommended once every five years. Replacing the sand can be a delicate manoeuvre, so it is best to use a local pool specialist to change the sand media. 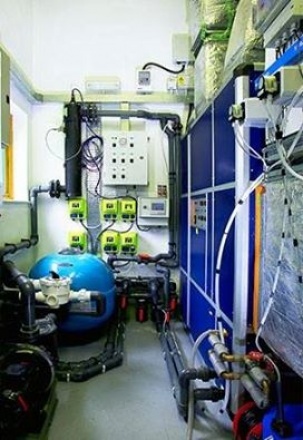 Typically speaking, a well-designed plant room is unlikely to leak, but if a leak does occur it is often a problem with the piping. If you suspect your plant room has a leak, call in your pool engineer immediately as a leak not only represents a potential hazard, it can also indicate a greater problem with your pool’s structural integrity. A pressure test can be performed on the piping which will enable the specialist to pinpoint the exact area of the problem. Also, your pool engineer will have a keen eye for detail, so he or she may be able to identify the problem without needing to perform any tests at all.